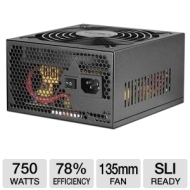 alaTest has collected and analyzed 597 reviews of Ultra LSP750 750-Watt Power Supply - ATX, SATA-Ready, SLI-Ready, 135mm Fan, Lifetime Warranty w/ Registration. The average rating for this product is 4.6/5, compared to an average rating of 4.2/5 for other Desktops for all reviews. Reviewers are impressed by the size. The usability is also appreciated. We analyzed user and expert ratings, product age and more factors. Compared to other Desktops the Ultra LSP750 750-Watt Power Supply - ATX, SATA-Ready, SLI-Ready, 135mm Fan, Lifetime Warranty w/ Registration is awarded an overall alaScore™ of 84/100 = Very good quality. I bought this as an upgrade to an old PSU I had in my gaming rig. Unfortunately, it died after about month. I have no idea what caused it to fail. I had to put my old PSU back in my computer, which is still running fine for now. I was so satisfied with my first one purchased in November of 2009; I bought another when it recently died a few weeks ago. I like the desing...easy to install...looks very nice and feels like is going to last a big chunck of time,,,has lots of different plugs to fit any system. I always go with Ultra for all my builds and have never been let down. Got this one on sale and it is worth every penny. It is silent, reliable, easy to install, and cables are the right length. Recommend it. All voltages were well within tolerances, very quiet. Tech support had rapid response to a question. This is a very nice psu BUT it is large and the stiff super long cables are hard to hide. Definately going with a modular psu next time. The new LSP is the latest addition to the line-up of professional power supplies. It provides the ultimate amount of power and performance. This series is 25% more efficient than its predecessor with the affordability and quality you have come to expect from Ultra. The LSP's sleek new design incorporates ascetics with functionality. This design comes with a 135mm cooling fan, which reduces heat by 20% and noise by 15 dB. In addition to the reduction of heat and noise, the LSP also comes with sleeved finished power cables, which provide better airflow and help reduce cable clutter. Over all this new LSP line of professional power supplies is the ultimate upgrade or addition to any system.